This experiment shows the behaviour of a diamagnetic and a paramagnetic substance in an outer magnetic field. Relative permeability and magnetic susceptibility are dimensionless quantities. Diamagnetic substances have relative permeability slightly smaller than one (that is, their susceptibility is negative), which means they slightly weaken surrounding magnetic field. If we put a magnet close to a diamagnetic substance, it will be slightly repelled. Diamagnetic substances are for example water, bismuth, graphite, copper or mercury. Paramagnetic substances have relative permeability slightly greater than one, which means they slightly strengthen the outer magnetic field. If we put a magnet close to a paramagnetic substance, it will be slightly attracted. Paramagnetic substances are for example copper sulphate, aluminium, platinum, chrome and others. We can use scales to measure attractive or repulsive forces between the magnet and the metal sample. The change of deflection on the scales translates to an attractive or a repulsive force. A suitable diamagnetic material is bismuth - a silver-grey metal available in small chunks or little needles (Fig. 2). Magnetic susceptibility of bismuth is −170·10-6. "Reconstructive chirurgical splint" (Fig 3) was chosen for the paramagnetic material. It is made out of non-ferromagnetic stainless steel and paramagnetic chrome. Chrome alone can be used as well. 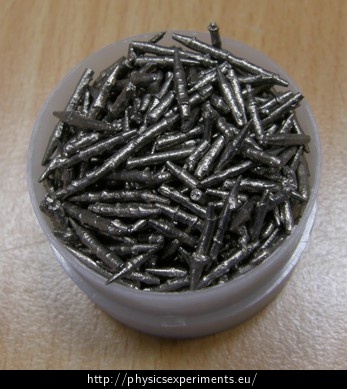 Magnetic susceptibility of chrome is +320·10-6. We try how high above the scales we must put the magnet so it does not affect the plate on the scales. Then we put a sufficiently high stand on the scales (so that a magnet lying on it does not affect the scales, usually about 25 cm is enough). We place our sample of bismuth on the stand and reset the scales. We repeat points 2 and 3 with our paramagnetic sample (a piece of chrome). If the scales cannot display negative values, we do not reset them at the beginning of our measurement, but we measure the difference of values at the beginning and after nearing the magnet. The force measured is very small, in order of single mN for samples the size of few tens of grams. 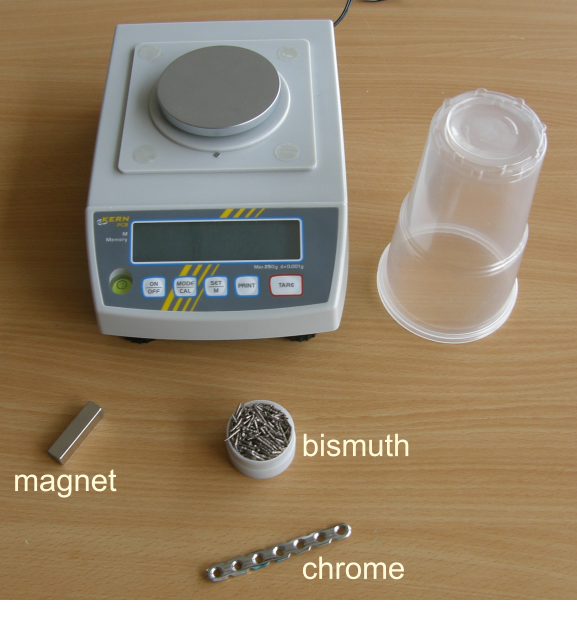 That is why we need to use scales sensitive to at least 0.01 g, or better 0.001 g.
Because the force between the magnet and the sample is very small, it is advised to use a strong magnet and put it very close to the sample, but so that it does not touch the sample.